Rich Gallego has been an incredibly valuable art instructor. He is a willing and generous fountain of knowledge and inspiration as I continue to learn and grow as an artist. Rich's depth of historical knowledge combined with his clear and precise explanations and demonstration of fundamental and advanced painting techniques have been essential on my path to improvement. Rich is infinitely patient with students of all levels, and his approach is one of constant encouragement and problem solving. He produces 100% effort to help each student become the best artist that they are capable of becoming. Class will be limited to 12 participants to ensure lots of individual attention. There’s a reason New Mexico is called “The Land of Enchantment”. Vast fields of Pinon and sage, beautiful blue mountains rising in the distance, groves of Cottonwoods and Aspens, centuries old adobe churches and homes, all combine to create a rich and colorful landscape that few painters could resist. 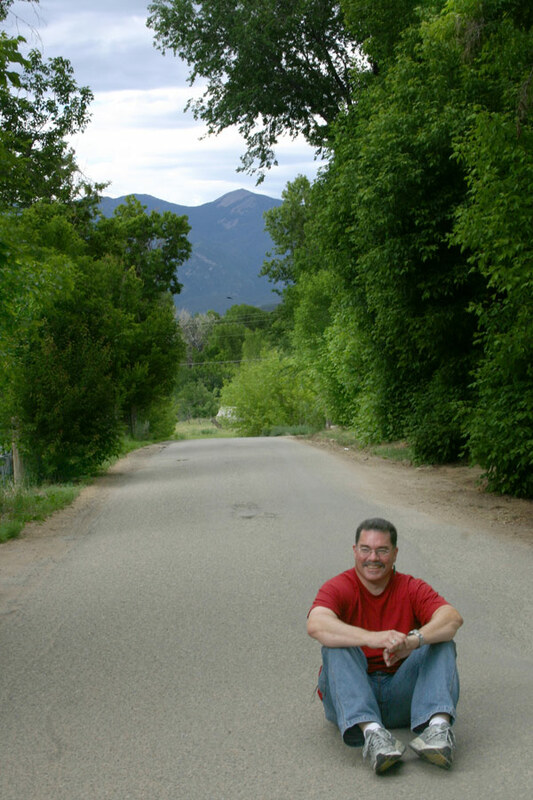 Come explore this historic part of the old west with award winning plein aire artist, Rich Gallego. He’ll show you how to simplify a scene and the painting process so you’ll be able to capture a sense of place regardless of where you’re painting. Rich will teach such fundamental principles as division of space, creating a compelling composition, assessing values, how to lead the viewer’s eye, color theory, treatment of edges, and proper paint application. Each day will be spent at a different painting site. 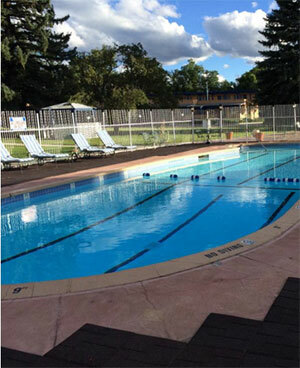 In some cases, the day will be divided into morning and afternoon sessions. Other days, we’ll travel a bit farther afield to experience some of the outlying area’s spectacular scenery. This class will include as many, or as few, instructor demonstrations as the participants desire. But, this isn’t one of those workshops where the students stand around and simply watch the teacher paint. Rich is a tireless instructor who genuinely enjoys giving one on one attention to each participant with the goal of helping you to become a better, more knowledgeable painter. Remember, because the best light for plein aire painting occurs in the “Golden Hours” of the morning and afternoon you’ll be getting started fairly early each day so, please be prompt. The exact time will depend upon where you’ll be painting on a given day. There will be several critique sessions throughout the week, usually in the evening. Attendance is certainly not mandatory but, these sessions are extremely valuable and students are encouraged to participate.  Painters of all levels are welcome in this class. However, if you’re an absolute beginner please consider the two day course immediately prior to this class. It will assure that you are comfortable with your equipment, materials, and getting started on your painting in the great outdoors. Please feel free to call us about this workshop. We love to chat about our classes. 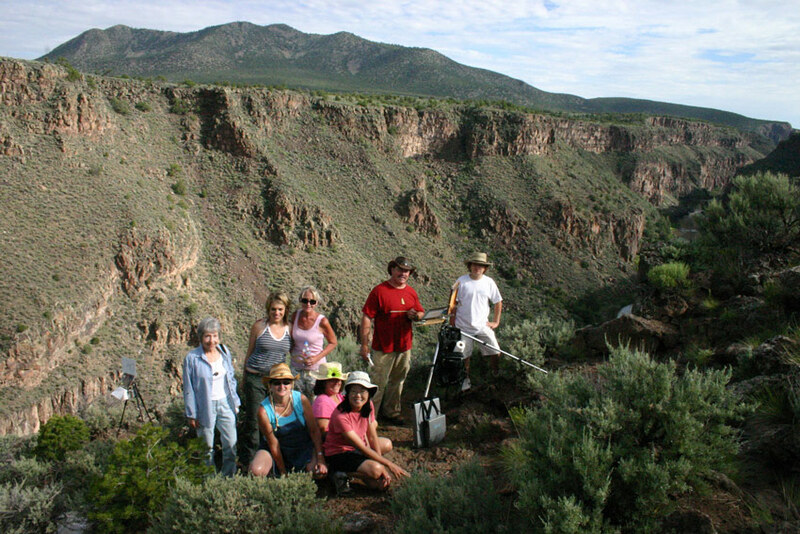 Feel free to call Taos Art School for more information - 575-758-0350. We love to chat about our classes. Born in 1962, Richard Gallego grew up in Los Angeles. Though raised in the city, he knew from the time of his first camping trip that it was the open spaces of the mountains and deserts that would continue to lure him back again and again. It wasn't long before what started as a creative diversion grew into a passion. 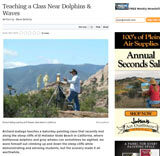 Richard attended ArtCenter College of Design in Pasadena in 1998 and in 2001, after receiving a portable sketch box easel as a gift, ventured out into the hills of Malibu to paint on location for the first time. He was hooked. The challenge of capturing the fleeting light, the changing colors, and the mood of a place first hand, while standing in the middle of it was captivating. He remembers laughing out loud and thinking,"What could be better than this?" Since then, ninety percent of Richard's painting has been done "en plein aire". He has studied with Mark Strickland at ArtCenter in Pasadena, CA, as well as with respected landscape painter and California Art Club signature member Karl Dempwolf. 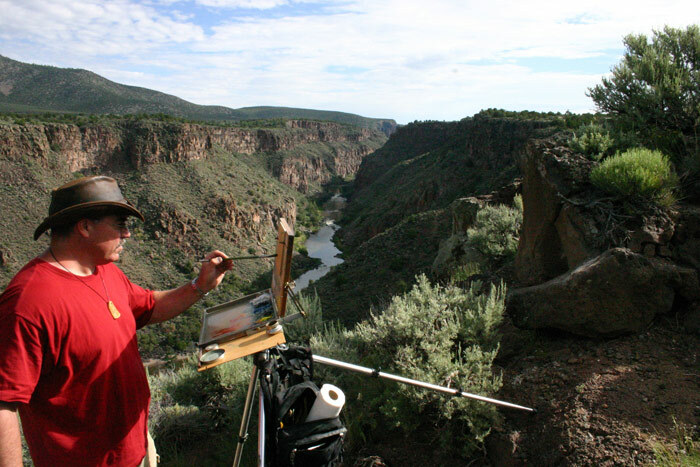 In 2006, with a group from The Taos Art School and instructor George Strickland, Richard spent a week painting at Canyon de Chelly. 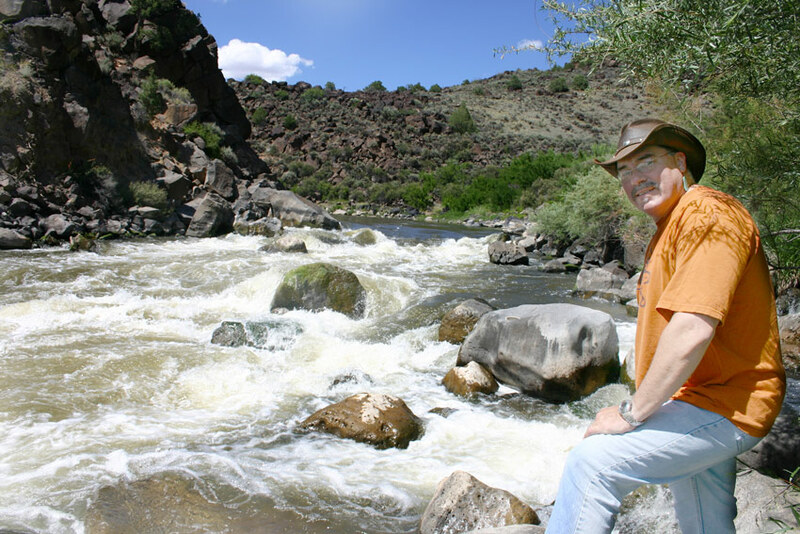 In addition to continuous study of the genre, Richard conducts weekly plein air painting workshops in and around California's Antelope Valley and has provided artist demonstrations for the Antelope Valley Allied Arts and the Lakes and Valleys Art Guild. 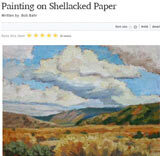 He lists Matt Smith, Scott Christensen, Paul Rafferty, Donald Hildreth, and Clyde Aspevig as some of the painters who have influenced him artistically. Richard lives in Palmdale, CA with his wife and two children. 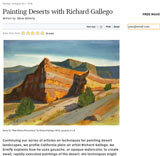 http://gallegoart.com - Visit the plein air and studio paintings of Richard Gallego. The weekend following this class is an exciting time to be in Taos, Because it is the time of TAOS FALL ARTS FESTIVAL: the largest art festival in Northern New Mexico showcasing only artists that reside in Taos County. They are hidden everywhere, and , come together once a year to show and compete. The Festival includes 3 major art shows: 1) The curated exhibit titled: DISTINGUISHED ACHIEVEMENT AWARD SERIES;2) A juried exhibit titled TAOS SELECT; and 3) the TAOS OPEN which, as its name implies, is open to all artists working here. So, this is your once-a-year chance to experience Taos’s famed creativity first hand since the festival represents over 250 Taos County artists working in a variety of mediums. Also, there is a FILM FESTIVAL and many other events. Please consider extending your stay for a day or two after the class, but make your hotel reservations early!